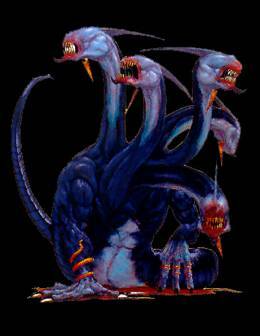 The Sisters of Tiamat are terrifying multi-headed serpents reminiscent of the hydras of legend. It is theorized that the Sisters actually are responsible for those legends, as ancient hieroglyphs have depicted them from a period before modern ken. Massive beasts that weigh tons, they propel themselves along with two muscular arms, dragging behind them a heavy carapace-covered tail. The Sisters have five heads capable of making lightning-fast strikes against multiple targets. They are savage hunters and while they have no visible eyes to speak of, not needing them in the vast darkness of their realm; they nonetheless see their enemies through some other sensory organ. Some believe they have the eyes of their Priestesses to guide them and do not need sensory organs, though this is plainly an argument born of ignorance. In the spawning pools of the Sisters of Tiamat, that mud drenched subterranean lair they breed in, dozens of young Sisters are born and raised every year. Named to honor their Goddess, the Sisters are her favored pets, bearing a slight resemblance to their dark patron. While the Sisters are of course all female, they do not reproduce asexually. Males of their species, marked as such by having only two heads, serve as breeding partners and attack beasts for the Stygian horde. When a Sister of Tiamat mates, a feat that happens violently twice a year, she returns to the spawning pools and selects a suitable male. She will then give birth six months later to a spawn of three to five children. If female, they will be taken to the outer shrines to be raised by the Handmaidens and trained by the Priestesses. Male spawn, the Favored of Tiamat are taken and raised by the Gatherers. Trained by the Stygians to stand guard over areas of importance in the Chaos Tombs and the catacombs beneath them, Sisters of Tiamat are the perfect watchdogs, no more than two heads ever sleeping at the same time. When the Stygians make war, the Sisters are corralled and brought up to serve as heavy infantry for the host, lumbering purposefully into the enemy, heads swaying back and forth, teeth gnashing and tearing. Few warbands can hold their wits when the Sisters of Tiamat take to the field.